Readily available worldwide, these notebooks are incredibly popular. This cover is meant to be quite thin so it won't add too much bulk, so they are made from relatively thin leather in a variety of colors. It is one piece of folded leather, yielding buttery smooth folded edges and a more compact package than the "full stitch" version. There is a slit cut in the back flap to allow usage of the elastic band that comes with the notebook. If these aren't in stock and you want one, let me know and I will arrange. This version of the cover is stitched all the way around. Separate pieces are used for the interior and exterior, allowing a wider variety of exterior colors that would be too thick for the wrap style above. It also allows for the addition of the options listed below. There is a slit cut in the back flap to allow usage of the elastic band that comes with the notebook. These are rarely in stock, but are always available in your choice of colors and options as a Build-Your-Own item. 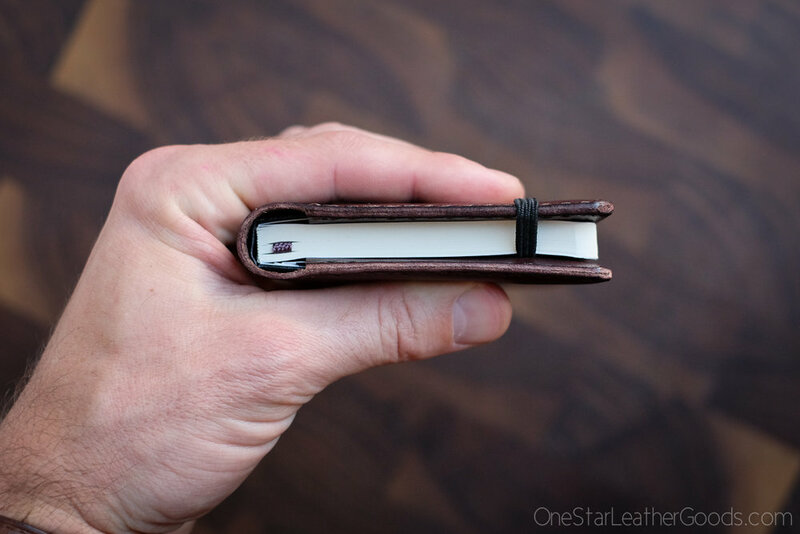 You can add a plain paged notebook when ordering for +$20.